Blues and Reds start the game as the attackers. Using 2 touch, try to keep ball from yellow. If yellow wins the ball, the team who gave it to yellow now defends. Make it competitive by trying to making 10 consecutive passes. Variation could be every third ball has to be split for a point. Coaching Points: compact and deny gaps when defending, expand the field when attacking. good support angles, movement off the ball. Each group goes for 15 minutes. Group 1 goes in 3 minute intervals with 1 minute break between each rep.
Coach technique and encourage maximum effort. While fatigued, players must maintain focus and technique. -Constant transition and awareness. Defenders become attackers and attackers becoming defenders. Play starts with a 4 v. 2 possession game. 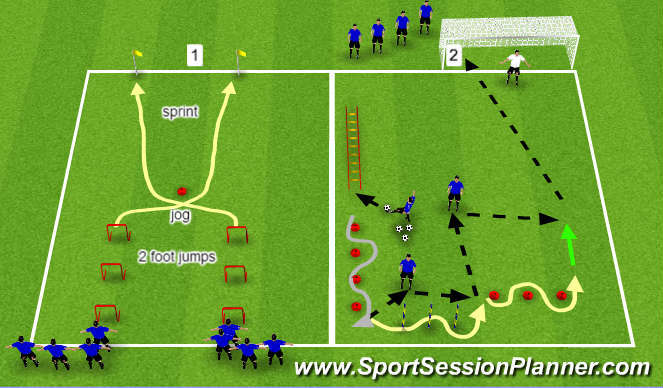 When the two inside players win the ball, they play 2 v. 2 in the other half, to try and score. Should the two defenders (Blue) win the ball, they quickly play the ball back to the original grid, and the two original defenders return back to the grid to defend.